Basket Landes reversed their 2008 Coupe de France defeat against Bourges Basket with a (58-56) victory. Benoît Lucbernet, the coach from Basket Landes, was able to get his players to refocus after finishing 4th during the national final four seven days earlier with an explosive first quarter (25-13). The remaining three quarters were difficult but Sarah Ousfar's calmness from the free-throw line at the end of the match was just enough for Basket Landes to end Bourges Basket's two year reign as Champions. Ousfar scored 16 points and pulled down 12 rebounds during her MVP match winning performance while Gaëlle Sourigues added 11 points. For Bourges Basket Romane Bernies did everything: she scored 24 points, dished out 6 assists, made 7 steals and was fouled 7 times. She went an impressive 10-of-12 from the free-throw line but it was not enough to take the victory. 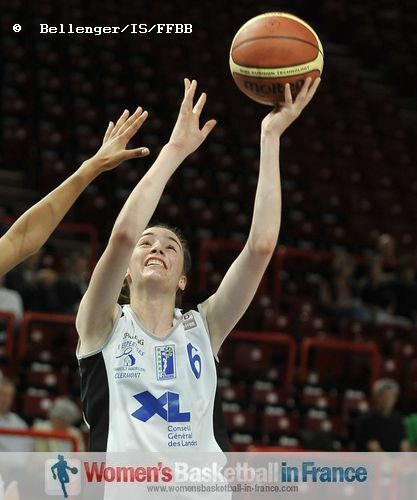 Nina Deal was the only other player from Bourges in double digits with 10 points. Basket Landes got off to a perfect start with Gaëlle Sourigues (right) hitting most of her shots and Sarah Ousfar dominating the paint to lead (14-6) with five minutes played. Anaïs Deyres hit a couple of free throws to complete the 11-0 run for a 12-point lead (18-6) with just six minutes played. Bourges Basket finally started to play basketball and Imane Brahmi started the revival. Then Pauline Lithard fired a three-pointer. 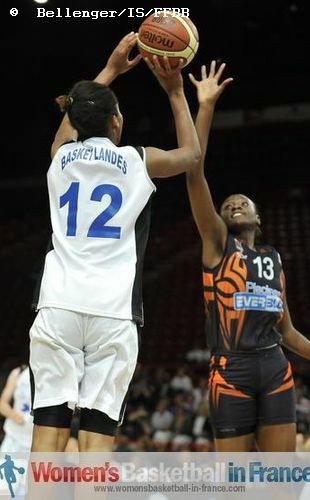 However Basket Landes were not missing much and restored the 12-point advantage by the end of the first quarter (25-13). After the offensive first quarter, the second quarter was all about defense. Bourges kept Basket Landes scoreless for the first five minutes while scoring only 5 points themselves (17-25). Ousfar was again the catalyst for Basket Landes as they started to find their way into the paint to go into the locker room leading (33-22). The third quarter turned into a youth basketball shoot-out. Basket Landes led by as many as 16 points at one stage but were unable to put Bourges away. Although Romane Bernies was all over the court for Bourges her team still trailed by 12 points (39-51) to start the final quarter. Bernies continued her one-lady show and with three minutes left to play Bourges Basket trailed by 3 points (51-54). Basket Landes stepped up defensively with Ousfar winning all the defensive rebounds. Offensively they only scored 2 points to lead (56-51) with the game in money-time. Bernies continued to be a pain in the side for Basket Landes as she came up with 2 steals, 2 assists for Rudiane Eduardo and 1 free throw for Bourges Basket to level the score (56-56) with 20 seconds left to play. With a few seconds left to play Nina Deal was called for an intentional foul (unsportsmanlike foul) on Ousfar. Ousfar hit both free throws. Bourges had no choice but to foul quickly to stop the clock. However they were not quick enough. Deyres missed the free throws but it did not matter as the game was over (58-56). 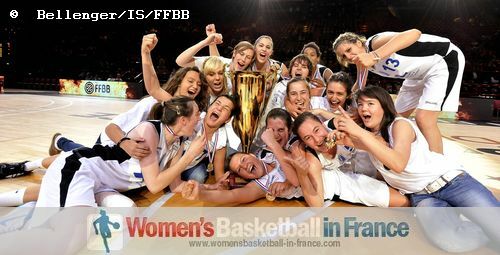 Basket Landes' Coupe de France victory is the first for the club in any category.